We have prepared the database of all Canada phone numbers for you. The main purpose of this database is to give you reliable information about Canadian phone numbers. The database is always up-to-date and is ready to provide you with actual data. 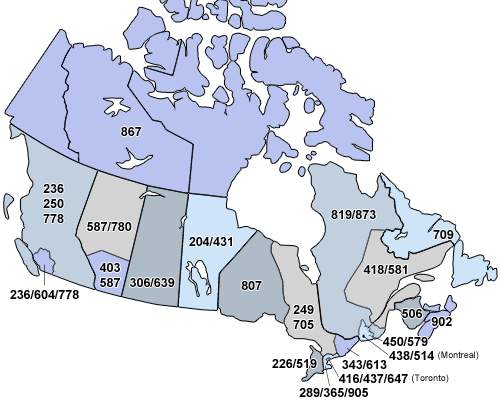 Here you can find any information concerning area codes: look at the area codes map or use Canada area codes list. Also, you can use search by number or search by city. phishing sites that look like on-line stores. Phone fraudsters use different causes for call. They can say that you win lottery prize or that they’re conducting a snap poll. Sometimes fraudsters can introduce themselves as radio staff, representatives of well-known companies, even your mobile operators or bank representatives. They can send you a message claiming themselves as your relatives who have changed their phone numbers. Anyhow, they will try to swindle money out of your pocket. Some phone fraudsters can scare you that your relatives or friends are in trouble and they need your financial support. Besides, you can get messages from your “operator” who’ll ask you to confirm your phone number by sending SMS. Some phone fraudsters will blackmail and threaten you. In order to avoid such negative experience, you can use our database of telephone numbers in Canada with area code finder and phone number finder. Our project can help you to struggle against fraudsters. But we do not guarantee that our number database can help in all cases. However, it can allow you to find out whose phone number is displayed on your screen. Using our service you can avoid telephone fraud due to reverse telephone lookup. We offer you to make a telephone number lookup for free. We grant you an opportunity to make a search by city or number. To make a search by city or by number, enter a 10-digit phone number or the city in the boxes above. Canadian phone number reverse lookup is very convenient service that will help you to check a specific phone number and get a line on it. Moreover, due to reverse call lookup it is possible to get information concerning address of phone owner. Therefore, you will be able to find location by phone number and find address by phone number. You can also help your relatives, your friends and other people to find the fraudsters if you provide a feedback on a specific number and leave a comment. It will help a great amount of people not to fall into the trap of phone fraudsters. Take care and use the Canadian area codes list.